Years ago, I had one of my first, great bonding moments with my (then new) father-in-law, Steve, over a particularly mountainous and delicious plate of corned beef hash. Sarah and I had just spent a week in the wilds of Northern California visiting her family and her folks took us out for a goodbye breakfast before we hopped our plane back to a Chicago. "What is everyone having" Sarah asked casually as we perused the menu. "Corned beef hash!" Steve and I proclaimed in anticipatory unison. When the plates of hash arrived, heaped high and steaming, we grinned at each other, relishing our fine choice. "You're going to eat ALL of that" Sarah somewhat judgmentally sniffed. "YEP! ", we exclaimed again in gleeful affirmation. Consumed with our hash, I think he and I said about two words throughout the remainder of breakfast. However, between bites we'd catch each other's eyes and giggle quietly at the expressions of silly satisfaction we both wore. I'm sure the ladies thought we had lost our minds! We ate every last morsel and felt appropriately indulgent. I've shared a lot of meals with my in-laws since then and every time a menu with corned beef hash presents itself, Steve and I partake with as much vigor as we did over that first breakfast. Personal musings aside, if this story illustrates nothing else, it's that corned beef is awesome! Fatty, salty and peppered with warm spice notes, it's a damn fine way to treat beef! The origin of corned beef is hotly debated. Evidence of it can be found in many cultures including Ancient Europe, the Middle East and the Caribbean. The term "corn" comes from the process of covering the beef in salt rocks or "corns" of salt to preserve it. In America, we usually and incorrectly attribute it to Ireland. However, many historians suggest that because beef was a luxury item in Ireland, it wasn't until Irish immigrants came to America - where beef was more readily available - that they began regularly eating it. It is mentioned in their historic texts, though. Notably in the very cool Irish tale from the 12th century, Aislinge Meic Con Glinne (or The Vision of MacConglinne). In this text a great king is cured of "the demon gluttony" by way of an endless host of food including - you guessed it - "perpetual joints of corned beef!" While brisket is the cut most commonly used, here I've elected to use something a little more exciting ... the tongue! Strong and awesome, the tongue may seem a little intimidating but if you can get past that, you're in for a real treat! Be warned, corned beef of any cut takes some time. I let this tongue brine for 3 days but the brining period could easily be increased to 5 days. 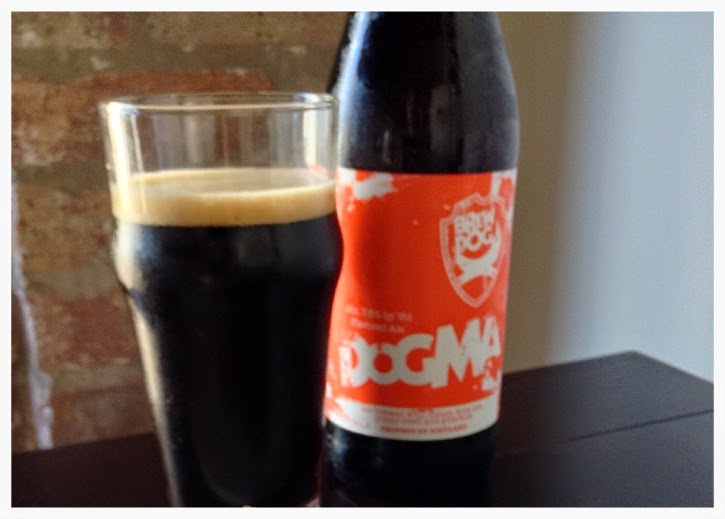 It makes fantastic corned beef for a Rueben Sandwich which in turn pairs beautifully with Brew Dog's Dogma Ale. By great coincidence (ha!) that batch of homemade sauerkraut I mentioned in the bonus post two weeks ago happened to be ready today. Just in time for this sandwich! Note the same mulling spices used in the sauerkraut are also used in the corn beef brining liquid. Harmony abound! Clean the tongue by cutting off the glands with a sharp knife and rinsing it under cool water. Place the rinsed tongue into the cold brine and submerge and refrigerate for 3-5 days. After 3-5 days rinse the tongue and discard the brine. In a stock pot add the tongue and enough water to cover it and the remaining 2 Tbsp. of mulling spice. Bring to a boil and cover. Turn down to a slow simmer and let cook for 2 hours. 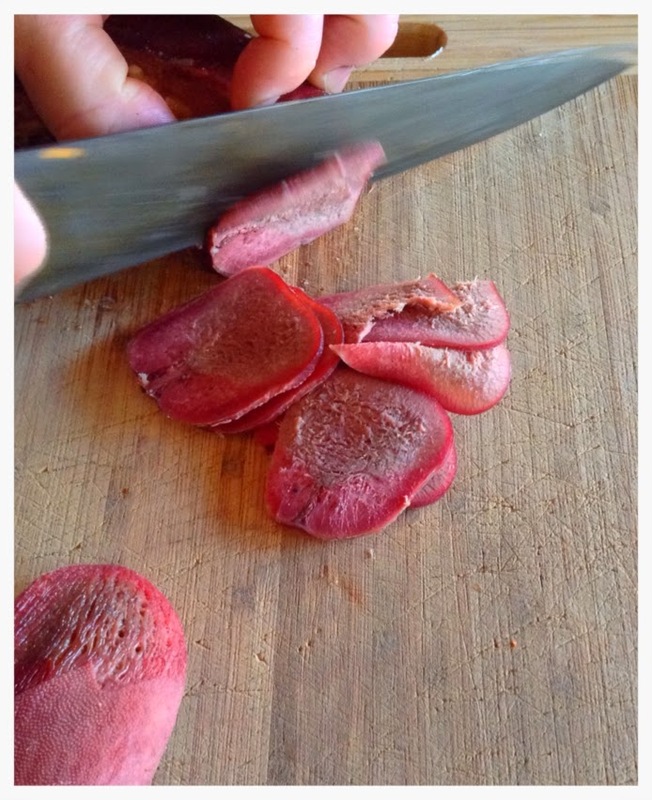 Let cool, then peel off the outer layer of the tongue. It should be very easy to peel this by hand. Slice to your desired thickness. In a large saute pan heat butter and place bread in it, toasting on both sides. In a separate sauté pan toss sliced tongue with some sauerkraut and heat through (don't go too long, though - the meat and kraut are meant to be warmed, not seared). Spread your favorite Reuben condiment on freshly toasted bread. Many opt for Thousand Island Dressing but I like to use a mustard aioli (equal parts of your favorite mustard and real mayonnaise, whipped together gently). Lay Swiss Cheese on the hot tongue and sauerkraut and broil for approximately 30 seconds. Assemble and enjoy. Notice the deep, dark mahogany color and the creamy khaki head. From the aromatics, note the sweet breadiness as well as licorice. Sweet tea flavors are evident in the taste, as well as dark malts, and honey with faint notes of spices. This pairing is a good example of comparison flavors (meaning like or comparable). The distinct flavor from the Pumpernickel Rye accentuate the maltiness and spice notes in the beer. The spices from the tongue are also subtly present and match well. While the beer is on the richer side, balance is found in the acidity from the sauerkraut which provides a cleansing of the palate. Similarly, the mustard aioli provides richness (such is the character of aioli) but also some tanginess from the mustard. You are! It's not scary at all. It's deelish! Plus you feel sort of smug in your foodie-ness after eating it! That looks ridiculously good! I have never heard of corned beef tongue before! It's pretty solid! Try it and let us know what you think! Reader participation is our favorite thing and I think you and Alex are just the two to try it!